Our best selling 14mm blue polypropylene rope sold wound on to a handy 220m reel. This cheap rope has an approximate breaking strain of 2700kg. 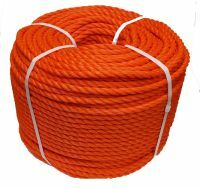 As a family owned rope supplier we keep large stocks of this 14mm discount rope at all times. This rope is often called by the generic name of nylon rope. Hard wearing, strong and rot proof rope for general purpose use at home, business and leisure. The image we have used here is of a 10mm blue rope reel.